When you need to send holiday office gift baskets, we know that there are two important things to consider before choosing your gift. First, you want to be able to find a gift basket that will be easy to share and will please many different tastes and sensibilities. Second, you want to be sure that the office Christmas hamper you send will be the right size: not too big for a small workplace, and not too small for a large one. We have collected together all of our gifts that feature a variety of delectable components suitable for sharing, and organized our gifts into those appropriate for small, medium and large offices to assist your search. A small office can have as few as two people in it. The key to picking the right gift for two to five or six people is to send enough but not too much! You want the gift to be eaten (nay, devoured! ), not sitting around in the lunchroom getting old and stale. We offer office Christmas baskets for small offices that won’t overwhelm but will deliver variety. 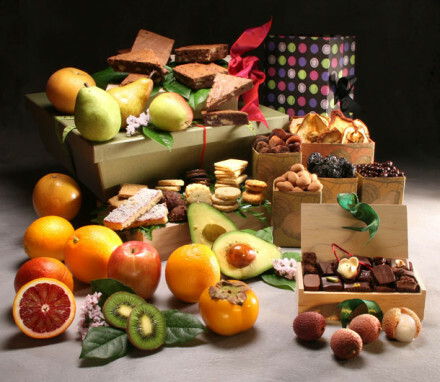 Our fruit and sweets gifts contain enough fresh fruit for everyone to have one, along with baked goods such as cookies, brownies, or breads, or with chocolates, for those with a sweet tooth. Finding a gift fitting for a medium sized office is perhaps the hardest to judge: you certainly don’t want to send a gift that is too small, but you also don’t want it overpower the workplace snack area. 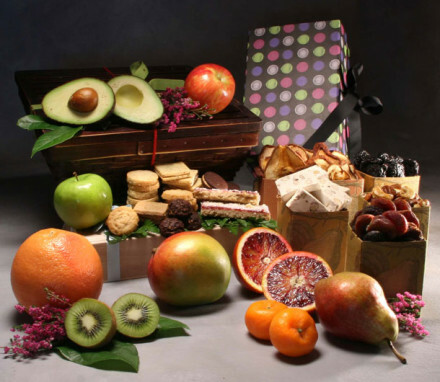 Our medium office Christmas gift baskets are perfectly proportioned for six to 10 or 12 people. 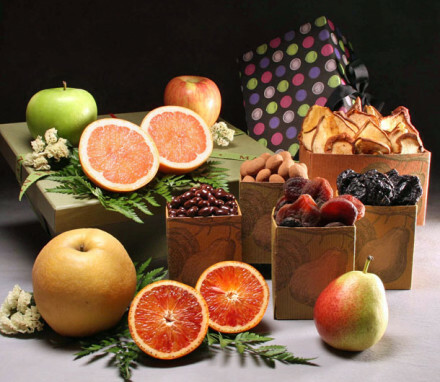 Similar to our small office gifts, we combine a variety of elements such as fresh fruit, dried fruit and nuts, baked goods, chocolates and sweets. Plentiful enough for everyone to have a taste of everything, or enough for each person to indulge in their personal favorite treat! If you are sending a gift to an office of over 12 people, then the math is simple: you want to send a BIG gift! Our selection of large office Christmas hampers builds on the medium office gifts by adding more of all the ingredients: fresh fruit, chocolate boxes and chocolate dipped dried fruits, sweet and savory breads, tiny delicate tea cookies and big fat cookies, bar trios and brownies, dried fruits and nuts, and a variety of easy snacking foods such as popcorn, falafel chips, and roasted chick peas. These gifts look abundant and bountiful! So if you aren’t sure which holiday office gift basket to send, just pick the size of the office, click on the category, and peruse our selections where you can trust that we have done the work for you!